Accused of plagiarism after graduating? Can your degree be rescinded? Universities take plagiarism very serious. Students work hard to earn their degree and conferral is celebrated. However, can your university rescind your degree if they find out you cheated or plagiarized? I graduated and have been working in the field with my degree. Can my university rescind it? The short answer is yes. If the college believes that you committed an academic integrity violation, they can open an investigation into the incident. If you are found responsible for cheating or plagiarism, they can rescind your degree. The accusations are not true, how can I defend myself? The process a graduate faces is the same that a current student faces. There will be an investigation into the incident and an committee hearing held. You must prepare your best defense to the allegations to protect your degree. I am being accused of plagiarism years after my dissertation was completed. Can my university do that? Yes. 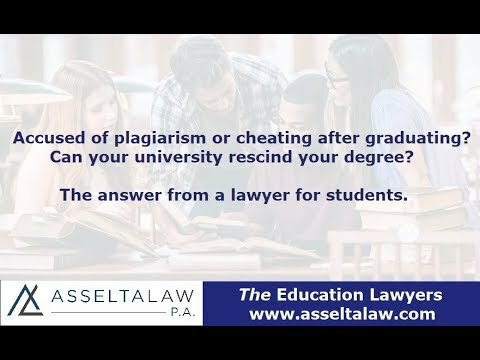 If the university received information that you earned a doctorate or other advanced degree by possibly cheating or plagiarizing, they can investigate. If there is merit to the allegation, they will charge you. If you are charged with an honor code violation, you must defend yourself to prevent the school from taking action against your degree. Can you help me stop the university from rescinding my degree? Yes. I help students all over the country build successful academic integrity defenses.